The cookies are full of delicious pumpkin and spice with a delicious cream cheese filling. The chocolate chips give these cookies just the right amount a sweetness and a great combination of flavors. These pumpkin whoopie pies just shout fall! 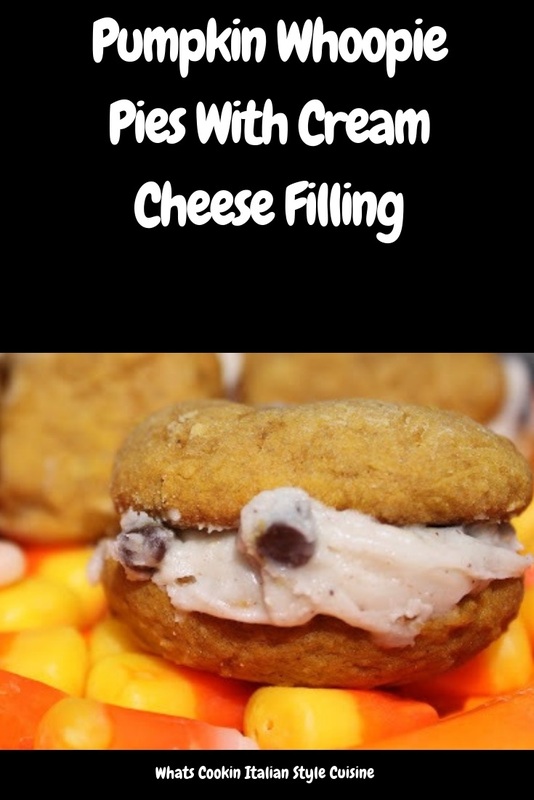 I just love the combination of cheese in these cookies, they are so smooth and creamy and the perfect filling with pumpkin. These cookies are a must make with sugar pie homemade pumpkin roasted, or you can use canned. Use parchment paper to bake them on. Do not over bake the cookies or they will be dry. Store them in air tight container or freeze and take out a few at a time. I use a melon ball scoop to make them the same perfect sizes. These Pumpkin whoopie pies are very easy to make. The kids love them, and you can even tint the filling orange for Halloween for a nice treat. They go great with apple cider or hot cocoa. These have the best aroma throughout the house while baking. The pumpkin and spice make a great cookie to bake if you are trying to sell your home. They sure are the perfect smell of fall with cinnamon and spice. Check out my Halloween Roundup of Great Fall Treats! These are delicious fall pumpkin filled whoopie pie cookie. The filling is cream cheese and chocolate chips. The cookies are a delicious addiction I make every year. Preheat oven to 350 degrees.Place all dry ingredients (except sugar) together in a bowl. Using an industrial power mixer, beat butter, sugar, molasses and vanilla in large bowl to blend. Add eggs 1 at a time, beating until blended after each addition. Add fresh pumpkin puree. Mix in dry ingredients alternately with milk till well blended and smooth around 35 seconds on a heavy duty mixer. Line large baking sheets with parchment paper. Drop dough by rounded teaspoon onto prepared sheets, spacing 2 inches apart, mold them with your fingers dipped in flour to be perfectly rounded and slightly flatten with finger tips. Bake for 11 to 13 minutes, or till set in the middle of the cakes. Cool completely on wire racks before filling. To make the filling, beat cream cheese and butter together on medium speed until well blended. Add sugar and spices, fold in chips. Fill each cooled whoopie pie with filling and sandwich together. These are SO cute Claudia. Pumpkin is one of my favorite foods to use in baked goods. I'm going to have to borrow this recipe for Thanksgiving for sure. Those whoopie pies look very pretty and delicious...yum. I never tried making whoopies, I can already taste from my computer screen. Soft, chewy and creamy, I want some right now! This looks spectacular. I love fall spices in just about anything. Thanks for sharing this great treat. They're absolutely perfect, Claudia. Love the spiced filling - it raises it up a bit in flavor. Love putting pumpkin in everything! SO much pumpkin this time of year...but, I do enjoy it in baked goods. These are a great idea. Healthy and delicious cookies, sure it looks the best cookies. Oh pumpkin how I love you..these look fabulous! These look terrific - love the choco chip spice creme filling yum! These chocolaty pies are really mini-gems, just wonderful! Love the fact that you're using squash...one of my favourite ingredients. Oh my goodness they look wonderful! I have yet to make pumpkin whoopie pies, I'll have to try yours! These look amazing!! And unique for a fall dessert! Thanks for the recipe.